"Wind Energy" මෙතැනට යළියොමුවෙයි. the academic journal සඳහා, Wind Energy (journal) බලන්න. සැකිල්ල:Sustainable energy Wind power is the use of air flow through wind turbines to mechanically power generators for electric power. Wind power, as an alternative to burning fossil fuels, is plentiful, renewable, widely distributed, clean, produces no greenhouse gas emissions during operation, consumes no water, and uses little land. The net effects on the environment are far less problematic than those of nonrenewable power sources. Wind farms consist of many individual wind turbines which are connected to the electric power transmission network. Onshore wind is an inexpensive source of electric power, competitive with or in many places cheaper than coal or gas plants. Offshore wind is steadier and stronger than on land, and offshore farms have less visual impact, but construction and maintenance costs are considerably higher. Small onshore wind farms can feed some energy into the grid or provide electric power to isolated off-grid locations. Wind power gives variable power which is very consistent from year to year but which has significant variation over shorter time scales. It is therefore used in conjunction with other electric power sources to give a reliable supply. As the proportion of wind power in a region increases, a need to upgrade the grid, and a lowered ability to supplant conventional production can occur. Power management techniques such as having excess capacity, geographically distributed turbines, dispatchable backing sources, sufficient hydroelectric power, exporting and importing power to neighboring areas, using vehicle-to-grid strategies or reducing demand when wind production is low, can in many cases overcome these problems. In addition, weather forecasting permits the electric power network to be readied for the predictable variations in production that occur. As of 2015, Denmark generates 40% of its electric power from wind, and at least 83 other countries around the world are using wind power to supply their electric power grids. In 2014 global wind power capacity expanded 16% to 369,553 MW. Yearly wind energy production is also growing rapidly and has reached around 4% of worldwide electric power usage, 11.4% in the EU. Wind power has been used as long as humans have put sails into the wind. For more than two millennia wind-powered machines have ground grain and pumped water. Wind power was widely available and not confined to the banks of fast-flowing streams, or later, requiring sources of fuel. Wind-powered pumps drained the polders of the Netherlands, and in arid regions such as the American mid-west or the Australian outback, wind pumps provided water for live stock and steam engines. 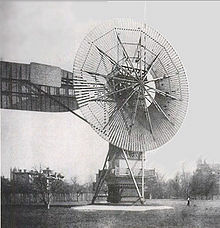 The first windmill used for the production of electric power was built in Scotland in July 1887 by Prof James Blyth of Anderson's College, Glasgow (the precursor of Strathclyde University). Blyth's 10 m high, cloth-sailed wind turbine was installed in the garden of his holiday cottage at Marykirk in Kincardineshire and was used to charge accumulators developed by the Frenchman Camille Alphonse Faure, to power the lighting in the cottage, thus making it the first house in the world to have its electric power supplied by wind power. Blyth offered the surplus electric power to the people of Marykirk for lighting the main street, however, they turned down the offer as they thought electric power was "the work of the devil." Although he later built a wind turbine to supply emergency power to the local Lunatic Asylum, Infirmary and Dispensary of Montrose the invention never really caught on as the technology was not considered to be economically viable. Across the Atlantic, in Cleveland, Ohio a larger and heavily engineered machine was designed and constructed in the winter of 1887–1888 by Charles F. Brush, this was built by his engineering company at his home and operated from 1886 until 1900. The Brush wind turbine had a rotor 17 m (56 foot) in diameter and was mounted on an 18 m (60 foot) tower. Although large by today's standards, the machine was only rated at 12 kW. The connected dynamo was used either to charge a bank of batteries or to operate up to 100 incandescent light bulbs, three arc lamps, and various motors in Brush's laboratory. Siemens and Vestas are the leading turbine suppliers for offshore wind power. DONG Energy, Vattenfall and E.ON are the leading offshore operators. As of October 2010, 3.16 GW of offshore wind power capacity was operational, mainly in Northern Europe. According to BTM Consult, more than 16 GW of additional capacity will be installed before the end of 2014 and the UK and Germany will become the two leading markets. Offshore wind power capacity is expected to reach a total of 75 GW worldwide by 2020, with significant contributions from China and the US. In 2012, 1,662 turbines at 55 offshore wind farms in 10 European countries produced 18 TWh, enough to power almost five million households. As of August 2013 the London Array in the United Kingdom is the largest offshore wind farm in the world at 630 MW. This is followed by Gwynt y Môr (576 MW), also in the UK. අක්ෂර දෝෂය: සැබෑ මොඩියුලක් නොමැත. Worldwide there are now over two hundred thousand wind turbines operating, with a total nameplate capacity of 432,000 MW as of end 2015. The European Union alone passed some 100,000 MW nameplate capacity in September 2012, while the United States surpassed 75,000 MW in 2015 and China's grid connected capacity passed 145,000 MW in 2015. World wind generation capacity more than quadrupled between 2000 and 2006, doubling about every three years. The United States pioneered wind farms and led the world in installed capacity in the 1980s and into the 1990s. In 1997 installed capacity in Germany surpassed the U.S. and led until once again overtaken by the U.S. in 2008. China has been rapidly expanding its wind installations in the late 2000s and passed the U.S. in 2010 to become the world leader. As of 2011, 83 countries around the world were using wind power on a commercial basis. Wind power capacity has expanded rapidly to 336 GW in June 2014, and wind energy production was around 4% of total worldwide electric power usage, and growing rapidly. The actual amount of electric power that wind is able to generate is calculated by multiplying the nameplate capacity by the capacity factor, which varies according to equipment and location. Estimates of the capacity factors for wind installations are in the range of 35% to 44%. By doubling installed capacity an average 40% increase in electricity production would be expected. Europe accounted for 48% of the world total wind power generation capacity in 2009. In 2010, Spain became Europe's leading producer of wind energy, achieving 42,976 GWh. Germany held the top spot in Europe in terms of installed capacity, with a total of 27,215 MW as of 31 December 2010. In 2015 wind power constituted 15.6% of all installed power generation capacity in the EU and it generates around 11.4% of its power. The wind power industry set new records in 2014– more than 50GW of new capacity was installed. Another record breaking year occurred in 2015, with 22% annual market growth resulting in the 60 GW mark being passed. In 2015, close to half of all new wind power was added outside of the traditional markets in Europe and North America. This was largely from new construction in China and India. Global Wind Energy Council (GWEC) figures show that 2015 recorded an increase of installed capacity of more than 63 GW, taking the total installed wind energy capacity to 432.9 GW, up from 74 GW in 2006. In terms of economic value, the wind energy sector has become one of the important players in the energy markets, with the total investments reaching සැකිල්ල:Currencybn (සැකිල්ල:Currencybn), an increase of 4% over 2014. Online data is available for some locations, and the capacity factor can be calculated from the yearly output. For example, the German nationwide average wind power capacity factor over all of 2012 was just under 17.5% (45867 GW·h/yr / (29.9 GW × 24 × 366) = 0.1746), and the capacity factor for Scottish wind farms averaged 24% between 2008 and 2010. A 2008 study released by the U.S. Department of Energy noted that the capacity factor of new wind installations was increasing as the technology improves, and projected further improvements for future capacity factors. In 2010, the department estimated the capacity factor of new wind turbines in 2010 to be 45%. The annual average capacity factor for wind generation in the US has varied between 29.8% and 34.0% during the period 2010–2015. A wind energy penetration figure can be specified for different durations of time, but is often quoted annually. To obtain 100% from wind annually requires substantial long term storage or substantial interconnection to other systems which may already have substantial storage. On a monthly, weekly, daily, or hourly basis—or less—wind might supply as much as or more than 100% of current use, with the rest stored or exported. Seasonal industry might then take advantage of high wind and low usage times such as at night when wind output can exceed normal demand. Such industry might include production of silicon, aluminum, steel, or of natural gas, and hydrogen, and using future long term storage to facilitate 100% energy from variable renewable energy. Homes can also be programmed to accept extra electric power on demand, for example by remotely turning up water heater thermostats. Electric power generated from wind power can be highly variable at several different timescales: hourly, daily, or seasonally. Annual variation also exists, but is not as significant. Because instantaneous electrical generation and consumption must remain in balance to maintain grid stability, this variability can present substantial challenges to incorporating large amounts of wind power into a grid system. Intermittency and the non-dispatchable nature of wind energy production can raise costs for regulation, incremental operating reserve, and (at high penetration levels) could require an increase in the already existing energy demand management, load shedding, storage solutions or system interconnection with HVDC cables. The variably of wind is quite different from solar, wind may be producing power at night when other baseload plants are often overproducing. Wind power hardly ever suffers major technical failures, since failures of individual wind turbines have hardly any effect on overall power, so that the distributed wind power is reliable and predictable,සැකිල්ල:Unreliable source? whereas conventional generators, while far less variable, can suffer major unpredictable outages. In particular geographic regions, peak wind speeds may not coincide with peak demand for electrical power. In the U.S. states of California and Texas, for example, hot days in summer may have low wind speed and high electrical demand due to the use of air conditioning. Some utilities subsidize the purchase of geothermal heat pumps by their customers, to reduce electric power demand during the summer months by making air conditioning up to 70% more efficient; widespread adoption of this technology would better match electric power demand to wind availability in areas with hot summers and low summer winds. A possible future option may be to interconnect widely dispersed geographic areas with an HVDC "super grid". In the U.S. it is estimated that to upgrade the transmission system to take in planned or potential renewables would cost at least $60 billion, while the society value of added windpower would be more than that cost. Germany has an installed capacity of wind and solar that can exceed daily demand, and has been exporting peak power to neighboring countries, with exports which amounted to some 14.7 billion kilowatt hours in 2012. A more practical solution is the installation of thirty days storage capacity able to supply 80% of demand, which will become necessary when most of Europe's energy is obtained from wind power and solar power. Just as the EU requires member countries to maintain 90 days strategic reserves of oil it can be expected that countries will provide electric power storage, instead of expecting to use their neighbors for net metering. The capacity credit of wind is estimated by determining the capacity of conventional plants displaced by wind power, whilst maintaining the same degree of system security. According to the American Wind Energy Association, production of wind power in the United States in 2015 avoided consumption of 73 billion gallons of water and reduced සැකිල්ල:Co2 emissions by 132 million metric tons, while providing $7.3 billion in public health savings. The energy needed to build a wind farm divided into the total output over its life, Energy Return on Energy Invested, of wind power varies but averages about 20–25. Thus, the energy payback time is typically around one year. An 2012 EU study shows base cost of onshore wind power similar to coal, when subsidies and externalities are disregarded. Wind power has some of the lowest external costs. The U.S. wind industry generates tens of thousands of jobs and billions of dollars of economic activity. Wind projects provide local taxes, or payments in lieu of taxes and strengthen the economy of rural communities by providing income to farmers with wind turbines on their land. Wind energy in many jurisdictions receives financial or other support to encourage its development. Wind energy benefits from subsidies in many jurisdictions, either to increase its attractiveness, or to compensate for subsidies received by other forms of production which have significant negative externalities. Secondary market forces also provide incentives for businesses to use wind-generated power, even if there is a premium price for the electricity. For example, socially responsible manufacturers pay utility companies a premium that goes to subsidize and build new wind power infrastructure. Companies use wind-generated power, and in return they can claim that they are undertaking strong "green" efforts. In the US the organization Green-e monitors business compliance with these renewable energy credits. Recent examples of small-scale wind power projects in an urban setting can be found in New York City, where, since 2009, a number of building projects have capped their roofs with Gorlov-type helical wind turbines. Although the energy they generate is small compared to the buildings' overall consumption, they help to reinforce the building's 'green' credentials in ways that "showing people your high-tech boiler" can not, with some of the projects also receiving the direct support of the New York State Energy Research and Development Authority. In the U.S., the wind power industry has recently increased its lobbying efforts considerably, spending about $5 million in 2009 after years of relative obscurity in Washington. By comparison, the U.S. nuclear industry alone spent over $650 million on its lobbying efforts and campaign contributions during a single ten-year period ending in 2008. This 2010 Harris Poll reflects the strong support for wind power in Germany, other European countries, and the U.S. In addition to the aerodynamic design of the blades, the design of a complete wind power system must also address the design of the installation's rotor hub, nacelle, tower structure, generator, controls, and foundation. Further design factors must also be considered when integrating wind turbines into electrical power grids. Wind is the movement of air across the surface of the Earth, affected by areas of high pressure and of low pressure. The global wind kinetic energy averaged approximately 1.50 MJ/m2 over the period from 1979 to 2010, 1.31 MJ/m2 in the Northern Hemisphere with 1.70 MJ/m2 in the Southern Hemisphere. The atmosphere acts as a thermal engine, absorbing heat at higher temperatures, releasing heat at lower temperatures. The process is responsible for production of wind kinetic energy at a rate of 2.46 W/m2 sustaining thus the circulation of the atmosphere against frictional dissipation. A global 1 km2 map of wind resources is housed at http://irena.masdar.ac.ae/?map=103 , based on calculations by the Technical University of Denmark. Unlike 'static' wind speed atlases which give a single average speed across multiple years, tools such as Renewables.ninja provide time-varying simulations of wind speed and power output from different wind turbine models at hourly resolution. Sunrise at the Fenton Wind Farm in Minnesota, United States. Erection of an Enercon E70-4 in Germany. Bozcaada Wind Farm in Çanakkale province, Turkey. ↑ 1.0 1.1 "GWEC, Global Wind Report Annual Market Update 2011" (PDF). Gwec.net. සම්ප්‍රවේශය 14 May 2011. ↑ "Wind power is cheapest energy, EU analysis finds". the guardian. සම්ප්‍රවේශය 15 October 2014. ↑ Walwyn, David Richard; Brent, Alan Colin (2015). "Renewable energy gathers steam in South Africa". Renewable and Sustainable Energy Reviews. 41: 390. doi:10.1016/j.rser.2014.08.049. ↑ Gipe, Paul (1993). "The Wind Industry's Experience with Aesthetic Criticism". Leonardo. 26 (3): 243–248. JSTOR 1575818. doi:10.2307/1575818. ↑ 7.0 7.1 Holttinen, Hannele; et al. (September 2006). "Design and Operation of Power Systems with Large Amounts of Wind Power" (PDF). IEA Wind Summary Paper, Global Wind Power Conference 18–21 September 2006, Adelaide, Australia. ↑ 8.0 8.1 Abbess, Jo (28 August 2009). "Wind Energy Variability and Intermittency in the UK". Claverton-energy.com. Archived from the original on 25 August 2011. ↑ "Impact of Wind Power Generation in Ireland on the Operation of Conventional Plant and the Economic Implications" (PDF). eirgrid.com. February 2004. Archived from the original (PDF) on 25 August 2011. සම්ප්‍රවේශය 22 November 2010. ↑ 10.0 10.1 Armaroli, Nicola; Balzani, Vincenzo (2011). "Towards an electricity-powered world". Energy & Environmental Science. 4 (9): 3193. doi:10.1039/c1ee01249e. ↑ Platt, Reg; Fitch-Roy, Oscar and Gardner, Paul (August 2012) Beyond the Bluster why Wind Power is an Effective Technology. Institute for Public Policy Research. ↑ 13.0 13.1 Huang, Junling; Lu, Xi; McElroy, Michael B. (2014). "Meteorologically defined limits to reduction in the variability of outputs from a coupled wind farm system in the Central US" (PDF). Renewable Energy. 62: 331–340. doi:10.1016/j.renene.2013.07.022. ↑ 14.0 14.1 Denmark breaks its own world record in wind energy. Euractiv.com (15 January 2016). Retrieved on 20 July 2016. ↑ 15.0 15.1 New record-breaking year for Danish wind power. Energinet.dk (15 January 2016). Retrieved on 20 July 2016. ↑ 16.0 16.1 REN21 (2011). "Renewables 2011: Global Status Report" (PDF). p. 11. ↑ 17.0 17.1 17.2 17.3 "GWEC Global Wind Statistics 2014" (PDF). GWEC. 10 February 2015. ↑ 18.0 18.1 The World Wind Energy Association (2014). 2014 Half-year Report. WWEA. පිටු 1–8. ↑ 19.0 19.1 19.2 Wind in power: 2015 European statistics. (PDF) . EWEA. ↑ 20.0 20.1 20.2 20.3 Price, Trevor J (3 May 2005). "James Blyth – Britain's First Modern Wind Power Engineer". Wind Engineering. 29 (3): 191–200. doi:10.1260/030952405774354921. ↑ Shackleton, Jonathan. "World First for Scotland Gives Engineering Student a History Lesson". The Robert Gordon University. සම්ප්‍රවේශය 20 November 2008. ↑ A Wind Energy Pioneer: Charles F. Brush, Danish Wind Industry Association. Accessed 2 May 2007. 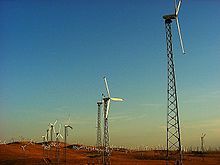 ↑ 32.0 32.1 AWEA: U.S. Wind Energy Projects – Texas Archived 29 December 2007 at the Wayback Machine. ↑ Whitelee Windfarm. Whitelee Windfarm. Retrieved on 20 July 2016. ↑ Meyers, Johan; Meneveau, Charles (1 March 2012). "Optimal turbine spacing in fully developed wind farm boundary layers". Wind Energy. 15 (2): 305–317. ISSN 1099-1824. doi:10.1002/we.469. ↑ Falahi, G.; Huang, A. (1 October 2014). "Low voltage ride through control of modular multilevel converter based HVDC systems". IECON 2014 – 40th Annual Conference of the IEEE Industrial Electronics Society: 4663–4668. ISBN 978-1-4799-4032-5. doi:10.1109/IECON.2014.7049205. ↑ Hulazan, Ned (16 February 2011). "Offshore wind power – Advantages and disadvantages". Renewable Energy Articles. සම්ප්‍රවේශය 9 April 2012. ↑ 43.0 43.1 Madsen & Krogsgaard (22 November 2010) Offshore Wind Power 2010 BTM Consult. Archived 30 June 2011 at the Wayback Machine. ↑ "1.1 Offshore wind market – 2012". globalccsinstitute.com. European Wind Energy Association (EWEA). 1 July 2013. සම්ප්‍රවේශය 16 March 2014. ↑ 45.0 45.1 "World’s second largest offshore wind farm opens off coast of Wales". Wales Online. සම්ප්‍රවේශය 18 June 2015. ↑ "London Array's own website announcement of commencement of offshore works" (PDF). සම්ප්‍රවේශය 6 July 2013. ↑ "London Array Project home page". Londonarray.com. 22 February 1999. සම්ප්‍රවේශය 6 July 2013. ↑ Greater Gabbard. "SSE wind farm Project Website". Sse.com. සම්ප්‍රවේශය 6 July 2013. ↑ DONG Energy. "Facts on Anholt Offshore Wind Farm". dongenergy.com. සම්ප්‍රවේශය 2 February 2014. ↑ BARD Offshore (1 August 2013). "Pioneering wind farm project BARD Offshore 1 successfully completed on the high seas". BARD Offshore. සම්ප්‍රවේශය 21 August 2014. ↑ "International Energy Statistics". U.S. Energy Information Administration (EIA). සම්ප්‍රවේශය 26 January 2015. ↑ 56.0 56.1 "China now the world leader in wind power production". The Globe and Mail. 11 February 2016. සම්ප්‍රවේශය 28 February 2016. ↑ "EU wind power capacity reaches 100GW". UPI. 1 October 2012. සම්ප්‍රවේශය 31 October 2012. ↑ "Spain becomes the first European wind energy producer after overcoming Germany for the first time". Eolic Energy News. 31 December 2010. සම්ප්‍රවේශය 14 May 2011. ↑ "Worldwide Electricity Production From Renewable Energy Sources: Stats and Figures Series: Fifteenth Inventory – Edition 2013" (PDF). 2.2 Electricity Production From Wind Sources: Main Wind Power Producing Countries – 2012 (text & table): Observ'ER. සම්ප්‍රවේශය 14 May 2014. ↑ "GWEC, Global Wind Energy Outlook 2010" (PDF). Gwec.net. සම්ප්‍රවේශය 14 May 2011. ↑ 62.0 62.1 "Market Forecast for 2016–2020". report. GWEC. සම්ප්‍රවේශය 27 May 2016. ↑ "Continuing boom in wind energy – 20 GW of new capacity in 2007". Gwec.net. සම්ප්‍රවේශය 29 August 2010. ↑ "Global Wind Energy Outlook 2014" (PDF). report. GWEC. October 2014. සම්ප්‍රවේශය 27 May 2016. ↑ Wind Power: Capacity Factor, Intermittency, and what happens when the wind doesn't blow?. Retrieved 24 January 2008. ↑ 67.0 67.1 Shahan, Zachary (27 July 2012). "Wind Turbine Net Capacity Factor – 50% the New Normal?". Cleantechnica.com. සම්ප්‍රවේශය 11 January 2013. ↑ Wind Power in Ontario These wind farms have capacity factors of about 28–35%. Archived 10 August 2014 at the Wayback Machine. ↑ "Capacity factor of wind power realized values vs. estimates" (PDF). 10 April 2009. සම්ප්‍රවේශය 11 January 2013. ↑ WindpoweringAmerica.gov, 46. U.S. Department of Energy; Energy Efficiency and Renewable Energy "20% Wind Energy by 2030" Archived 2 May 2013 at the Wayback Machine. ↑ "Transparent Cost Database". En.openei.org. 20 March 2009. සම්ප්‍රවේශය 11 January 2013. ↑ "Portugal atingiu valor recorde do século na produção de eletricidade renovável e de emissões de CO2 evitadas". QUERCUS. සම්ප්‍රවේශය 14 August 2016. ↑ 78.0 78.1 "the Spanish electricity system: preliminary report 2011" (PDF). January 2012. p. 13. Archived from the original (PDF) on 13 May 2012. ↑ "Renewables". eirgrid.com. Archived from the original on 25 August 2011. සම්ප්‍රවේශය 22 November 2010. ↑ Bundesministerium für Wirtschaft und Technologie (February 2012). "Die Energiewende in Deutschland" (PDF) (in ජර්මන්). Berlin. p. 4. ↑ 82.0 82.1 "A New Era for Wind Power in the United States" page XIV. United States Department of Energy, 2013. Retrieved: March 2015. ↑ "BP Statistical Review of World Energy June 2016 – Electricity" (PDF). BP. සම්ප්‍රවේශය 12 September 2016. ↑ "BP Statistical Review of World Energy June 2016 – Renewable energy" (PDF). BP. සම්ප්‍රවේශය 12 September 2016. ↑ "Tackling Climate Change in the U.S." (PDF). American Solar Energy Society. January 2007. Archived from the original (PDF) on 26 November 2008. සම්ප්‍රවේශය 5 September 2007. 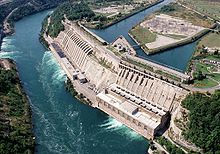 ↑ A study commissioned by the state of Minnesota considered penetration of up to 25%, and concluded that integration issues would be manageable and have incremental costs of less than one-half-cent ($0.0045) per kW·h. "Final Report – 2006 Minnesota Wind Integration Study" (PDF). The Minnesota Public Utilities Commission. 30 November 2006. Archived from the original (PDF) on 1 December 2007. සම්ප්‍රවේශය 15 January 2008. ↑ ESB National Grid, Ireland's electric utility, in a 2004 study that, concluded that to meet the renewable energy targets set by the EU in 2001 would "increase electricity generation costs by a modest 15%" "Impact of Wind Power Generation in Ireland on the Operation of Conventional Plant and the Economic Implications" (PDF). ESB National Grid. February 2004. p. 36. Archived from the original (PDF) on 25 March 2009. සම්ප්‍රවේශය 23 July 2008. ↑ 94.0 94.1 Center for National Policy, Washington DC, 11 June 2012, "What States Can Do: The Clean Revolution"
↑ "Claverton-Energy.com". Claverton-Energy.com. සම්ප්‍රවේශය 29 August 2010. ↑ "Is wind power reliable?". Archived from the original on 5 June 2010. සම්ප්‍රවේශය 29 August 2010. ↑ 100.0 100.1 "Why wind power works for Denmark". Civil Engineering. May 2005. සම්ප්‍රවේශය 15 January 2008. ↑ Realisable Scenarios for a Future Electricity Supply based 100% on Renewable Energies Gregor Czisch, University of Kassel, Germany and Gregor Giebel, Risø National Laboratory, Technical University of Denmark Archived 1 July 2014 at the Wayback Machine. ↑ Archer, C. L.; Jacobson, M. Z. (2007). "Supplying Baseload Power and Reducing Transmission Requirements by Interconnecting Wind Farms" (PDF). Journal of Applied Meteorology and Climatology. American Meteorological Society. 46 (11): 1701–1717. Bibcode:2007JApMC..46.1701A. doi:10.1175/2007JAMC1538.1. ↑ "Red Eléctrica de España | Wind produces more than 60% of the electricity consumed in Spain during the early hours of this morning". www.ree.es. සම්ප්‍රවේශය 27 July 2015. ↑ Bentham Paulos (16 December 2013). "How Wind Met All of Denmark’s Electricity Needs for 90 Hours". The Contributor. සම්ප්‍රවේශය 5 April 2014. ↑ Reinventing Fire. Chelsea Green Publishing. 2011. පි. 199. ↑ "Small Wind Systems". Seco.cpa.state.tx.us. සම්ප්‍රවේශය 29 August 2010. ↑ "Lake Erie Wind Resource Report, Cleveland Water Crib Monitoring Site, Two-Year Report Executive Summary" (PDF). Green Energy Ohio. 10 January 2008. සම්ප්‍රවේශය 27 November 2008. This study measured up to four times as much average wind power during winter as in summer for the test site. ↑ "The Combined Power Plant: the first stage in providing 100% power from renewable energy". SolarServer. January 2008. සම්ප්‍රවේශය 10 October 2008. ↑ Diesendorf, Mark (2007). "Greenhouse Solutions with Sustainable Energy": 119. Graham Sinden analysed over 30 years of hourly wind speed data from 66 sites spread out over the United Kingdom. He found that the correlation coefficient of wind power fell from 0.6 at 200 km to 0.25 at 600 km separation (a perfect correlation would have a coefficient equal to 1.0.) There were no hours in the data set where wind speed was below the cut-in wind speed of a modern wind turbine throughout the United Kingdom, and low wind speed events affecting more than 90 per cent of the United Kingdom had an average recurrent rate of only one hour per year. ↑ "Dinorwig Hydroelectric Plant, Wales". Thegreenage.co.uk. Archived from the original on 11 January 2013. සම්ප්‍රවේශය 11 January 2013. ↑ "Geothermal Heat Pumps". Capital Electric Cooperative. සම්ප්‍රවේශය 5 October 2008. ↑ Wind Energy Conserving Water. Awea.org. Retrieved on 20 July 2016. ↑ Patel, Mukund R. (2006). Wind and Solar Power Systems – Design, analysis and Operation (2nd සංස්.). CRC Press. පි. 303. ISBN 0-8493-1570-0. http://www.fanarco.net/books/misc/Wind_and_power_Solar_System.pdf. ↑ "LBNL/NREL Analysis Predicts Record Low LCOE for Wind Energy in 2012–2013". US Department of Energy Wind Program Newsletter. සම්ප්‍රවේශය 10 March 2012. ↑ "The Merit-Order Effect: A Detailed Analysis of the Price Effect of Renewable Electricity Generation on Spot Market Prices in Germany" (PDF). Archived from the original (PDF) on 29 August 2010. සම්ප්‍රවේශය 29 August 2010. ↑ 140.0 140.1 "Renewable energy now cheaper than new fossil fuels in Australia". Bloomberg New Energy Finance. Sydney: Bloomberg Finance. 7 February 2013. ↑ Diane Cardwell (20 March 2014). "Wind Industry’s New Technologies Are Helping It Compete on Price". New York Times. ↑ "Offshore Wind Accelerator". The Carbon Trust. සම්ප්‍රවේශය 20 January 2015. ↑ "Global wind expert says offshore wind will be one of the cheapest UK energy sources by 2025". The Carbon Trust. 23 September 2014. සම්ප්‍රවේශය 20 January 2015. ↑ "Direct Federal Financial Interventions and Subsidies in Energy in Fiscal Year 2010". Report. Energy Information Administration. 1 August 2011. සම්ප්‍රවේශය 29 April 2012. ↑ "Production Tax Credit for Renewable Energy". Ucsusa.org. 2 January 2013. සම්ප්‍රවේශය 11 January 2013. ↑ "Renewable Electricity Production Tax Credit (PTC)". Dsireusa.org. ↑ "Financial Incentives for Renewable Energy". Dsireusa.org. ↑ "Small-scale wind energy". Carbontrust.co.uk. සම්ප්‍රවේශය 29 August 2010. ↑ Kart, Jeff (13 May 2009). "Wind, Solar-Powered Street Lights Only Need a Charge Once Every Four Days". Clean Technica. Clean Technica. සම්ප්‍රවේශය 30 April 2012. ↑ "Smale scale wind energy". Carbontrust.com. සම්ප්‍රවේශය 11 April 2012. ↑ Hamer, Mick (21 January 2006). "The Rooftop Power Revolution". New Scientist. Reed Business Information Ltd. (2535). සම්ප්‍රවේශය 11 April 2012. ↑ MacKen, K.J.P. ; Green, T.C. ; Belmans, R.J.M. (2002). "Active filtering and load balancing with small wind energy systems". 10th International Conference on Harmonics and Quality of Power. Proceedings (Cat. No.02EX630). 2. පි. 776. doi:10.1109/ICHQP.2002.1221533. ISBN 978-0-7803-7671-7. ↑ "IPCC Working Group III – Mitigation of Climate Change, Annex II I: Technology – specific cost and performance parameters" (PDF). IPCC. 2014. p. 10. සම්ප්‍රවේශය 1 August 2014. ↑ "IPCC Working Group III – Mitigation of Climate Change, Annex II Metrics and Methodology. pg 37 to 40,41" (PDF). ↑ 175.0 175.1 "Why Australia needs wind power" (PDF). සම්ප්‍රවේශය 7 January 2012. ↑ "Wind energy Frequently Asked Questions". British Wind Energy Association. සම්ප්‍රවේශය 21 April 2006. ↑ Eilperin, Juliet; Steven Mufson (16 April 2009). "Renewable Energy's Environmental Paradox". The Washington Post. සම්ප්‍රවේශය 17 April 2009. ↑ "Wind farms". Royal Society for the Protection of Birds. 14 September 2005. සම්ප්‍රවේශය 7 September 2008. ↑ Lindsay, Richard (October 2004). "WIND FARMS AND BLANKET PEAT The Bog Slide of 16 October 2003 at Derrybrien, Co. Galway, Ireland" (PDF). The Derrybrien Development Cooperatve Ltd. සම්ප්‍රවේශය 20 May 2009. ↑ Gipe, Paul (1995). Wind Energy Comes of Age. John Wiley & Sons. පිටු 376–. ISBN 978-0-471-10924-2. https://books.google.com/books?id=8itBNxBL4igC&pg=PA376. ↑ Gohlke JM et al. Environmental Health Perspectives (2008). "Health, Economy, and Environment: Sustainable Energy Choices for a Nation". Environmental Health Perspectives. 116 (6): A236–A237. PMC 2430245  . PMID 18560493. doi:10.1289/ehp.11602. ↑ Hamilton, Tyler (15 December 2009). "Wind Gets Clean Bill of Health". Toronto Star. Toronto. pp. B1–B2. සම්ප්‍රවේශය 16 December 2009. ↑ "Estimating U.S. Government Subsidies to Energy Sources: 2002–2008" (PDF). Environmental Law Institute. September 2009. සම්ප්‍රවේශය 31 October 2012. ↑ 189.0 189.1 Pernick, Ron and Wilder, Clint (2007). The Clean Tech Revolution: The Next Big Growth and Investment Opportunity. Collins. p. 280. ISBN 0-06-089623-X. ↑ 196.0 196.1 196.2 196.3 "Wind Energy and the Environment" (PDF). Renewable Energy House. Archived from the original (PDF) on 5 August 2012. සම්ප්‍රවේශය 17 January 2012. ↑ 197.0 197.1 197.2 "A Summary of Opinion Surveys on Wind Power" (PDF). Archived from the original (PDF) on 5 August 2012. සම්ප්‍රවේශය 17 January 2012. ↑ 198.0 198.1 "Public attitudes to wind farms". Eon-uk.com. 28 February 2008. Archived from the original on 4 May 2012. සම්ප්‍රවේශය 17 January 2012. ↑ 199.0 199.1 "The Social Acceptance of Wind Energy". European Commission. Archived from the original on 28 March 2009. ↑ "Community Power Empowers". Dsc.discovery.com. 26 May 2009. Archived from the original on 25 March 2009. සම්ප්‍රවේශය 17 January 2012. ↑ "Carbon footprint of electricity generation" (PDF). Postnote Number 268: UK Parliamentary Office of Science and Technology. October 2006. සම්ප්‍රවේශය 7 April 2012. ↑ "Energy". සම්ප්‍රවේශය 31 October 2012. ↑ 205.0 205.1 "Grave developments for battle site". The Engineer. : 6. 13 June 2003. ↑ "'Rise in Scots wind farm support'". 19 October 2010. ↑ "Community Power Empowers". Dsc.discovery.com. 26 May 2009. සම්ප්‍රවේශය 17 January 2012. ↑ "Public attitudes to wind farms". Eon-uk.com. 28 February 2008. Archived from the original on 14 March 2012. සම්ප්‍රවේශය 17 January 2012. ↑ "Wind Farms in Cumbria". සම්ප්‍රවේශය 3 October 2008. ↑ "Group Dedicates Opening of 200 MW Big Horn Wind Farm: Farm incorporates conservation efforts that protect wildlife habitat". Renewableenergyaccess.com. සම්ප්‍රවේශය 17 January 2012. ↑ "National Code for Wind Farms" (PDF). Environment.gov.au. Archived from the original (PDF) on 5 September 2008. සම්ප්‍රවේශය 17 January 2012. ↑ 224.0 224.1 "Wind Energy Opposition and Action Groups". Wind-watch.org. සම්ප්‍රවේශය 11 January 2013. ↑ The Australia Institute (October 2006) Wind Farms: The facts and the fallacies Discussion Paper No. 91, සැකිල්ල:ISSN, p. 28. ↑ "Whitelee Windfarm". Scottish Power Renewables. ↑ (PDF) Wind Turbines in Denmark. section 6.8, p. 22, Danish Energy Agency. November 2009. 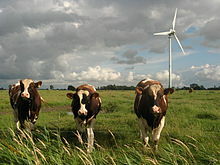 ISBN 978-87-7844-821-7. http://www.ens.dk/sites/ens.dk/files/supply/renewable-energy/wind-power/Vindturbines%20in%20DK%20eng.pdf. ↑ Cramer, Glenn (30 October 2009). "Town Councilor regrets High Sheldon Wind Farm (Sheldon, NY)". සම්ප්‍රවේශය 4 September 2015. ↑ Broadcast Wind, LLC. "Solutions for the Broadcasting and Wind Energy Industries". සම්ප්‍රවේශය 4 September 2015. ↑ "IMPACT OF WIND FARMS ON RADIOCOMMUNICATION SERVICES". TSR (grupo Tratamiento de Señal y Radiocomunicaciones de la UPV/EHU). සම්ප්‍රවේශය 4 September 2015. ↑ Donoghue, Andrew (30 July 2009). "Wind industry should avoid branding opponents "Nimbys"". Business Green. Business Green. සම්ප්‍රවේශය 13 April 2012. ↑ "Efficiency and performance" (PDF). UK Department for Business, Enterprise & Regulatory Reform. සම්ප්‍රවේශය 29 December 2007. ↑ "What factors affect the output of wind turbines?". Alternative-energy-news.info. 24 July 2009. සම්ප්‍රවේශය 6 November 2013. ↑ Zehnder, Alan T. & Warhaft, Zellman (27 July 2011). "University Collaboration on Wind Energy" (PDF). Cornell University Atkinson Center for a Sustainable Future. සම්ප්‍රවේශය 22 August 2011. ↑ 246.0 246.1 "Harvesting the Wind: The Physics of Wind Turbines" (PDF). සම්ප්‍රවේශය 11 January 2013. ↑ "What is wind?". Renewable UK: Education and careers. Renewable UK. 2010. Archived from the original on 4 March 2011. සම්ප්‍රවේශය 9 April 2012. ↑ "A 32-year perspective on the origin of wind energy in a warming climate" (PDF). Renewable Energy. 77: 482–492. 2015. doi:10.1016/j.renene.2014.12.045. ↑ Seeing the Wind with the New Global Wind Atlas International Renewable Energy Agency, 21 October 2015. ↑ Presentation. (PDF) . Retrieved on 20 July 2016. ↑ Global Wind Atlas. Global Wind Atlas. Retrieved on 20 July 2016. ↑ Hurley, Brian. "How Much Wind Energy is there? – Brian Hurley – Wind Site Evaluation Ltd". Claverton Group. සම්ප්‍රවේශය 8 April 2012. ↑ 255.0 255.1 Ananthaswamy, Anil & Le Page, Michael (30 January 2012). "Power paradox: Clean Might Not Be Green Forever". New Scientist. ↑ Jacobson, M. Z.; Archer, C. L. (2012). "Saturation wind power potential and its implications for wind energy". Proceedings of the National Academy of Sciences. 109 (39): 15679. Bibcode:2012PNAS..10915679J. doi:10.1073/pnas.1208993109. ↑ Adams, A. S.; Keith, D. W. (2013). "Are global wind power resource estimates overstated?". Environmental Research Letters. 8: 015021. Bibcode:2013ERL.....8a5021A. doi:10.1088/1748-9326/8/1/015021. ↑ "Wind Statistics and the Weibull Distribution". Wind-power-program.com. සම්ප්‍රවේශය 11 January 2013. Wind power හා සබැඳි මාධ්‍ය විකිමාධ්‍ය කොමන්ස් හි ඇත. මේ පිටුව අන්තිමට සැකසුවේ 18 මාර්තු 2017 දින දී, 05:27 වේලාවෙහිදීය.